The attempt at a realistic full-scale war video game has been attempted in the past but with its October 25 (27 in UK) release, Battlefield 3 seems to have outdone itself. Battlefield 3 is a first person single-player shooter and action video game made by Electronic Arts with system link and online multiplayer capabilities allowing up to 24 players to play at once via Xbox live or the PSNetwork on the console’s (PS3 and Xbox 360) and 64 players on the PC. With full vehicle warfare with playable tanks, humvees, jets, boats, ATV’s, and helicopters, Battlefield is the first video game released this year of it’s kind. Battlefield is run on a new engine called Frostbite 2 which allowed the developers to program in better physics in the explosions and it allowed the developers to increase the amount of detail in the game. Of course Battlefield’s multiplayer features full scale combined arm’s battles. It is possible to go from a boat to a jet to a tank. Depending on the vehicle under the players control there are three sets of controls which are classified under infantry controls. There are ground vehicle controls, which consists of tanks and boats and other vehicles that don’t leave the ground. Then there are the aerial controls. With all the great graphics and advances in the games physics there is a sense of loneliness on the larger maps where enemy players are in short supply and hard to find. With only 24 players on the console playing in a full map meant for 64 players on the PC the scale of the map is off putting at first but on the smaller map game modes like squad deathmatch and team deathmatch the sense of scale is similar to Call of Duty 4. Console systems simply couldn’t handle a full 64 player battle though so the producers were forced to lower the amount of players allowed on a map to cut down on lag and bandwidth issues. Which has already been a problem on the Xbox because the server’s were down yesterday because of a bandwidth issue. If EA doesn’t fix its servers it could be a serious issue that could make or break a game. Another new addition is it’s co-op mode. This is mode features multiple scenarios that force you and one other team mate to work together to complete the map’s mission objective. Don’t be fooled though just because it says co-op there is no split-screen multiplayer in order to play with your friends you must play over the internet or system link (LAN connection) the two devices. Battlefield 3 was released with nine maps, 55 weapons, 27 weapon attachments that are awarded separately for each gun. 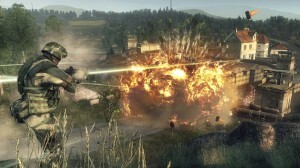 There are 22 playable vehicles, 28 vehicle specializations, and 14 soldier specializations according to the GameInformer Battlefield 3 preview. Also there are five playable online game modes which are. Conquest: The objective of this game mode is to capture and hold control points placed throughout the map and to decrease the opposing teams ticket (respawn) count to zero before your teams reaches zero. Rush: There are two sides to this conflict, an attacker and a defender. Attackers are charged with destroying multiple sets of 2 M-Com stations at a time before their ticket count reaches zero. Defenders are supposed to make sure that the M-Com stations aren’t destroyed and to make the attackers ticket count reach zero. Team Deathmatch: A new game mode to Battlefield the object of this game is for 2 teams to battle and kill the opposing team 100 combined times. The first team to reach a combined kill count of 100 wins. Squad Deathmatch: Another new game mode to Battlefield. Features four squads of four players each fighting each other to get the highest combined squad kill count. Squad Rush: In squad rush there are two teams with four players each one attacking one defending with similar qualities to rush just not as many people and thus more complicated and tactical than its larger game mode counterpart. 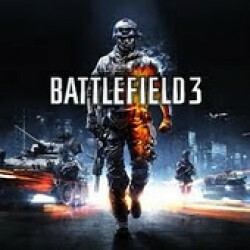 In all, Battlefield 3 is one of the most anticipated game’s of 2011 and with awards like Game of the Year from E3 it is a good way to spend your money and makes a great holiday gift for all FPS fans. We really enjoy viewing your posts! I’ve found a great website for the best web host reviews you should check out! It is PHP Web Hosts. Keep up the excellent work!